B @ Home Guest House is one of the highly recommended Piet Retief guest houses and provides accommodation in 14 guest rooms for tourists visiting the Grass & Wetlands region. 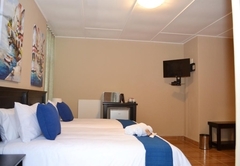 Situated in the heart of the small town of Piet Retief approximately 30km from the border of Swaziland, B @ Home Guest House is a quiet, homely guesthouse for those looking for home away from home accommodation. 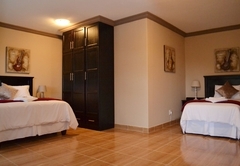 B @ Home Guest House offers a warm comfortable stay in tastefully decorated rooms. 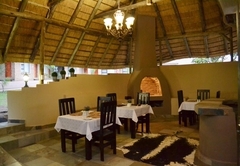 The guest house is wheelchair friendly and children are welcome and guests are assured of personal attention.. 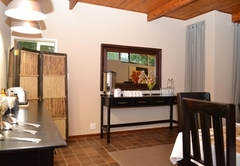 There is a choice of 13 en-suite rooms each with private entrances. 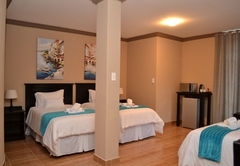 The rooms are spacious and are furnished with double or queen beds and in some rooms extra ¾ beds can be added for extended families. Baby cribs are available on request. 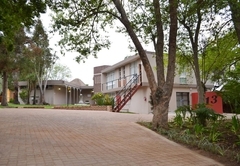 Each room has high quality towels and linen, DStv with limited channels, mini fridges, microwaves, a coffee / tea tray and gas geysers. 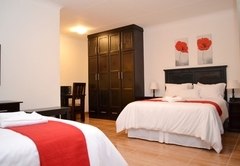 Single / double room with double bed, en-suite bathroom with shower. Limited DStv channels, mini fridge, microwave, coffee / tea tray. Ideal for a single person. 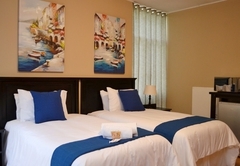 Spacious room which consists of a Queen bed and an extra ¾ bed for a larger family. En- suite bathroom witha shower. Limited DStv channels, mini fridge, microwave, coffee / tea tray. 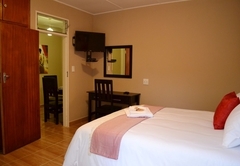 Single / double rooms with Queen bed and en -suite bathroom with shower. Limited DStv channels, mini fridge, microwave, coffee / tea tray. Single / double room with Queen bed. The en- suite bathroom has a bath. Limited DStv channels, mini fridge, microwave, coffee / tea tray. Spacious single / double room with two ¾ beds. The en -suite bathroom has a bath. Limited DStv channels, mini fridge, microwave, coffee / tea tray. 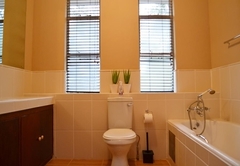 Very spacious double room with three ¾ beds and en- suite bathroom with shower. Limited DStv channels, mini fridge, microwave, coffee / tea tray. Secure parking on the premises. 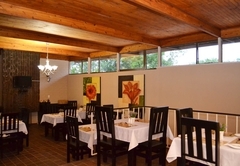 A full English breakfasts and Wi-Fi is available in the Lapa or eating lounge. 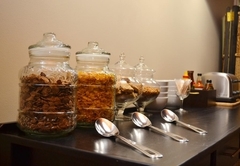 Breakfast packs and lunch packs can be arranged on request. Laundry services on special request. 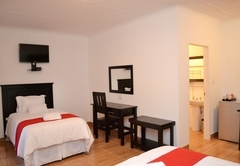 The Double rooms have en-suite bathrooms with shower. TV and Limited DSTV channels, mini fridge, microwave, coffee / tea tray. 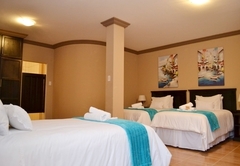 The 3 sleeper family room is spacious room consist of queen bed with extra 3/4 bed for larger family. Baby cribs / bath available on request. En- suite bathroom with shower. Limited DSTV channels, mini fridge, microwave, coffee / tea tray. 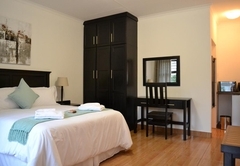 The Twin rooms have two three-quarter beds, en-suite bathrooms with shower. TV and Limited DSTV channels, mini fridge, microwave, coffee / tea tray. 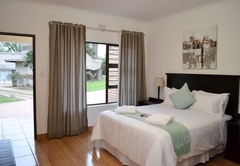 Very spacious double room with 1x queen size and 2x 3/4 beds and en- suite bathroom with shower. TV with Limited DSTV Channels, mini fridge, microwave, coffee / tea tray. Baby crib and bath available on request. Booked for two nights and it was great staying in a quiet suburb, others we stayed at are all along the main road and VERY noisy at night. 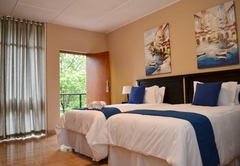 The rooms were efficient with basic needs and comfortable. Breakfast was adequate. Staff were caring and well managed. Facilities kept in good repair and clean. Will definitely stay there again. Be sure to take your own soap and shampoo. Three of us booked for two nights – 29th & 30th April. Separate rooms. We were very pleasantly surprised by the B&B. 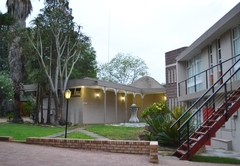 Firstly it is off the main road in a quiet & tidy suburb of Piet Retief. Secondly the reception & bookings were handled efficiently & competently by a person who had been trained properly & could speak English. Thirdly the whole complex was neat & well maintained: the rooms we were given were modern, well laid out, warm & had good shower & toilet facilities. DSTV was on offer but we didn’t make much use of it. Fourthly breakfast was very good and was served in an attractive dining room by pleasant staff. Would we stay here again? Definitely! Response timeB @ Home Guest House typically responds to requests in 5-10 minutes.